Premier and Minister of Finance Honourable Andrew Fahie has said that Former Chief Minister, the late Hamilton Lavity Stoutt had a courageous spirit, a quality displayed in everything in which he was involved. The Premier said the former Chief Minister had the courage to plan his work and the people of the BVI now enjoy the fruits of his labour. Minister for Education and Culture, Dr. the Honourable Natalio Wheatley paid tribute to the Territory’s ancestors and highlighted the important role they played in their survival by banding together as a community. He said that in order for the Territory to do well, this practice must be carried on. Honourable Wheatley said, “The importance of a cohesive sense of community and togetherness to the development of the Territory cannot be taken lightly. Students need to be taught the importance of the strength of community and this lesson cannot simply be taught in a classroom. This lesson is taught through example”. The event also saw presentations including dances from the Ebenezer Thomas and the Leonora Delville Primary Schools, and performances from Zion Sounds. Deputy Secretary at the Premier’s Office Mr. Malvern Brathwaite delivered the featured address. Remarks were also made by the family’s respondent, Ms. Gwendolyn Rubaine and Mr. Elroy Turnbull who represented the first Cohort of BVI Scholars to attend the University of the West Indies. 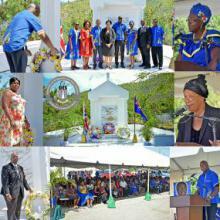 The annual event was observed on Monday, October 4 at the Cappoon’s Bay Cemetery and it was observed under the theme, “Back to Basics”.